In a salad bowl beat egg and sugar until mixture gets a lighter color. Add flour and corn starch and whisk. Heat 1 large saucepan half filled with water. Prepare ganache: Dice ganache butter and white chocolate and put it, along with the whipping cream, in a smaller saucepan or a metal bowl. Put in (or over, depending the size) the heating water. (This technique is called bain-marie; it’s the best way to melt chocolate without burning it). Pour white chocolate mixture in an ice-cube tray and leave in the freezer. 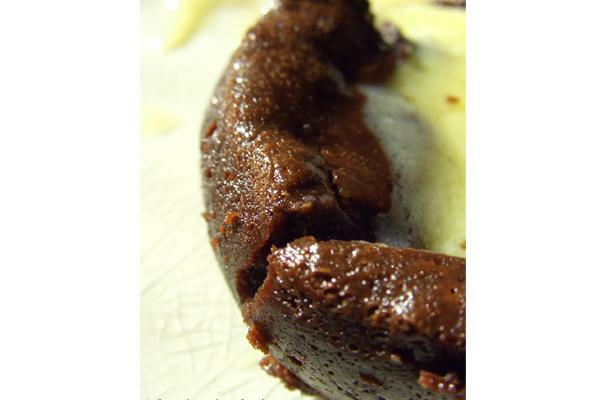 Prepare cake: Melt dark chocolate along with butter and whipped cream “au bain-marie” like you did with white chocolate. Mix molten chocolate in with egg and sugar mixture until it gets smooth. Leave preparation for 1h in the fridge so mixture gets thicker. If you’re going to use a muffin mold, grease it. If you have round pastry cutters, line baking tray with parchment paper and place pastry cutters on it. Cut pieces of parchment paper a little bigger than the height of your pastry cutters, circle them and cover pastry cutters sides with it. Fill 2/3 of the pastry cutters with chocolate mixture. Add on top one or two cubes of white chocolate ganache (depending on their size) and push a little with your finger so ganache gets inside. Heat in oven for 6 to 7 minutes. Take chocolate cakes out of the oven and pull carefully parchment paper first and pastry cutters next. (If cooking paper doesn’t come out easily, they’re not cooked enough… Don’t break them! Put them back in the oven a minute more).